Bathroom cabinets are stocked in a range of styles and sizes by home improvement outlets like Wickes DIY, often to match the bathrooms. This means you can create a totally co-ordinated look. While fitting bathroom cabinets requires relatively little in the way of DIY skills, there’s more to think about than you realise. If you have children you must make sure the cabinet isn’t near a window or within easy reach of clambering places – for example, the toilet. Children have a habit of reaching things they’re not supposed to, so you should look at locking bathroom cabinets if yours will be used to house medicines. Check the place you’ve chosen can be easily reached by adults, and is not too high. Above the sink is the usual place, especially if the cabinet is mirrored, but there’s no hard and fast rule. When looking to buy bathroom cabinets, you should think about the amount you want to store. 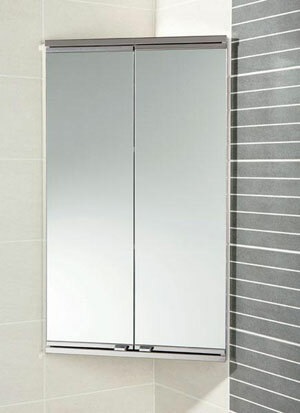 If you’ve decided on an ornate or double-door style with mirrors, you must remember that this will make it heavy. This weight will be increased once it is full. If the cabinet will house a lot of things it might be better to have two smaller bathroom cabinets, for example a “his and hers”. Alternatively, you could fit a corner shelf unit to hold the things that don’t need to be locked away. If the cabinet is part of a larger bathroom project, it should be installed after the rough wiring is completed, but before the flooring is laid. If you are tiling, remember to leave spaces for the bathroom cabinets – they are placed directly against the wall. 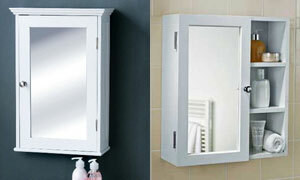 Bathroom cabinets may be fully assembled or sold in flat-pack form. Some are pre-painted, while others are left bare for you to paint or stain to match your décor. This must be done before they’re hung. 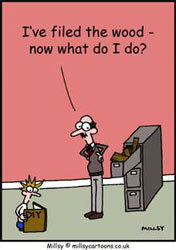 If your cabinet is pre-assembled, remove all the drawers, shelves etc before fixing it to the wall. If it’s flat-packed, check all the parts are there, and then assemble everything except the shelves. Some people prefer to leave the doors off until after fixing as well, especially if the cabinet is large. Check that the wall is smooth, level, and able to take the weight of the cabinet (i.e. don’t attach it to a boarded partition). Check the wall with a straight edge, marking any uneven bumps. Also, check there are no cables where you’ll be drilling. Stores like Wickes DIY sell AC detectors that light up when a live current is detected – use one to check that where you’ll be drilling is safe. Bathroom cabinets have pre-drilled holes in the back. Measure the space between these, and then mark corresponding places on the wall, using a spirit level. Drill holes and insert wall plugs (generally, these are provided). Get someone to hold the cabinet to the wall while you screw it in place. Make a final check to ensure it’s totally level, and insert the shelves. Well fitted bathroom cabinets are essential to bathrooms, so make sure yours is securely fitted to the wall before putting anything in it.